In any PPC campaign, you need to maintain a delicate balance between expanding your keyword list as much as possible and keeping it relevant to your topic. Once you’ve gathered a comprehensive keyword list, you need to clean it up. The advanced features of our PPC checker will allow you to choose the best keywords based on CPC, volume, difficulty level and other vital metrics. If you use multiple channels for gathering keywords, you will probably find numerous duplicates in your list. The ‘Remove duplicates’ button will delete them in one click. The tool also helps quickly remove special characters and unnecessary figures. Keyword grouping is another important stage in preparing a PPC campaign. A manual drag-and-drop feature is available,; or, if you prefer to keep one keyword per group (also known as SKAG), choose the ‘1 keyword = 1 group’ option. 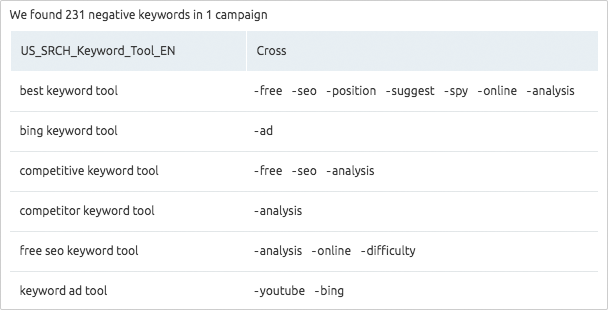 When using the broad or modified broad match type in your campaigns, cross-matching negative keywords can be a real headache. Some search terms may cause your ads to compete with each other, making your CPC grow. It’s extremely time consuming to find and remove these negative keywords manually, unless you use the PPC Keyword Tool. 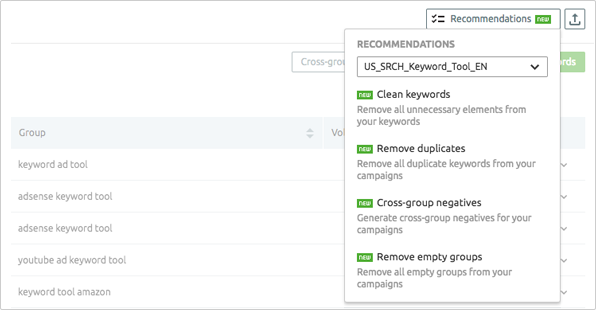 The ‘Cross-group negatives’ function will save you hours, especially when you manage big campaigns. It helps you stay on budget and avoid competition among your own ads. Recommendations are helpful for those new to PPC, but will also come in handy for experts. 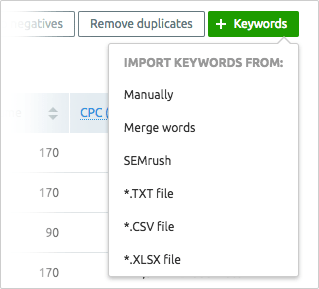 There’s always a chance that you might overlook duplicates, negatives or unnecessary elements in your keyword list. The Recommendations feature allows you to bring your campaign to perfection. A handy tip: execute the recommendations in the same order they are given. If you start with cross-group negatives and then proceed with cleaning keywords, you will then need to go back and check if new cross-group negatives have appeared.